Probably one of the most snuggly types of dog beds is the classic donut dog bed. Our gorgeous range of luxury donut dog beds includes those handmade by the wonderful British brand Mutts & Hounds. These luxury dog beds are machine washable. Choose from a fabulous selection of colourful fabric covers for your designer donut dog bed including the very patriotic union jack fabric. One of our best sellers at Chelsea Dogs is the donut dog bed and it’s easy to see why. The bolster style dog bed is a favourite among many dog breeds as they love to curl up with walled support to snuggle into. We searched up and down the country to find the best donut dog beds we could and they come from top brands Hugo and Hennie and Danish Design. Not only are the materials used the highest quality but all our donut dog beds are hand made in the UK. Danish Design have a great selection of tweed fabrics and a fun pheasant print, perfect for country hounds. 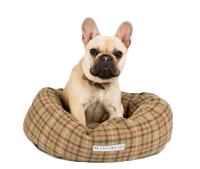 Hugo and Hennie have a wide selection of luxurious fabrics to choose from including the very popular Union Jack print and the dog beds have a waterproof liner and removable covers that can be machine washed.